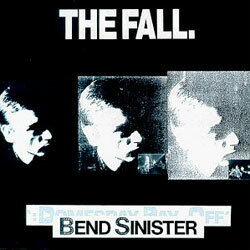 There are two reasons why I think ‘Bend Sinister’, the Fall’s tenth album, is their best. Firstly, it finds them at a rare, almost unique point of balance. By the time of its release in 1986 they had already reached more career peaks than most bands manage. The satanic Lovecraftian skiffle of ‘Dragnet’, the sheer clattering energy, confidence and scale of ‘Hex Enduction Hour’ and the bombed out garage rock of ‘This Nation’s Saving Grace’ took British post-punk to places where no-one could follow, carving out a place in the nation’s alternative canon that would forever be theirs, guarded by the snaggletooth attack dog himself. On ‘Bend Sinister’ The Fall were exploring ways out of this territory. It’s a much more understated record than almost anything they recorded before or since, with a subtle sound where, for once, Mark E. Smith does not dominate proceedings. This is the first record with Simon Woolstencroft behind the drums, the infamous double-drummers Paul Hanley and Karl Burns having finally both departed. However its rare sense of balance between the five band members must surely be largely due to Brix Smith’s ongoing presence as a leavening agent for her husband’s bile and bombast. For me Brix is the person who teased The Fall out of what could have become a musical cul-de-sac in the early 80s and, arguably, showed them how to introduce the wider influences which ultimately they (or at least MES) would work into a career which has lasted 30 years. So, it’s a more restrained, more intriguing, cleaner, at times poppier record in which Mark’s vocals and lyrics form just a part of a beguiling sound. Plus, y’know, ‘Dktr Faustus’, ‘U.S. 80’s-90’s’, ‘Terry Waite Sez’, ‘Bournemouth Runner’… I could go on. Anyway, the second good reason why ‘Bend Sinister’ is the best Fall album is that it’s the first I ever heard. I have a lad called Gareth Evans to thank for that. In a 4th year English lesson in 1986 he asked me if i’d heard “the Fall album” after i’d bored my classmates with tales of my first ever live concert, Public Image Limited at the Manchester Apollo. Unwilling to be unseated as the class hipster, a role I had only gained five minutes earlier and which I would would not hold on to for much longer, I said “yes” and told him how much I liked it. So then I had to go out and buy it. It sounded nothing like I expected, I had no idea what to make of it, it was mysterious and opaque. Within 12 months I had all their albums and they were ensconced as my favourite band. Despite our relationship cooling over the last decade or so, no-one has yet been able to usurp their place in my heart, and at the centre of that most special place, is the sound of ‘Bend Sinister’. Tom Listened: Another revelation. So much easier than I was expecting and, despite having the indie disco standard ‘Mr Pharmacist’ getting in the way (as far as I’m concerned), the rest of the album sounded wonderful. My experience of The Fall before this meeting was limited to the singles – none of which I have really liked – and Hex Enduction Hour, which I borrowed from a mate a long time ago and had a half-hearted attempt at getting to know. I dare say that if I had actually bought HEH, I would have put in the necessary hours and no doubt grown to love it…it’s illogical but owning the record (as opposed to borrowing it) really does make a difference to me. I do remember HEH being an awkward customer, perhaps too tangential and monotone for my young ears that were, at the time, immersed in the psychedelic sounds of the 60s, the poppy side of 70s alternative and the Madchester/US Indie scenes of the late 80s. I think Bend Sinister would have been a better record for a first date with ME Smith as I found it hook laden, bright and relatively conventional in terms of song structures. My guess would be that these days I would probably like the more challenging offerings from The Fall’s back catalogue just as much, if not more, but I would also be keen to spend considerably more time with Bend Sinister. Nick listened: About seven years ago either my girlfriend (now wife) or I bought 50,000 Fall fans can’t be wrong – 39 Golden Greats, the double-CD, career-spanning Fall ‘best of’ that co-opted an Elvis Presley compilation’s title and cover artwork, and subverted it to the will of Mark E Smith. It remains the only Fall CD in our collection, which must contain somewhere in the region of 1,800 albums, not because neither of us liked it (we’ve liked it enough to not get rid of it in any of the periodic mini purges we make via eBay or Amazon Marketplace), but because, well, where the hell does one start with The Fall? And, f one does start with The Fall, where the hell does one stop? With over 30 albums and little or no consensus over which period is their best (although there does seem to be some consensus on which period is their worst – recent years – even if the last decade contains a number of albums seemingly received as the dreaded “returns to form” [as if that meant anything]), one needs a way in, and if one gets hooked it’s going to be an expensive catching-up session. I suspect this is part of the reason behind my reticence – I like what Mark E Smith makes his band do, the aesthetic, the sound, but I don’t want to have to spend £100 on (just) a third of their discography and be left missing out on the no doubt essential songs strewn across the other 2/3s. So Bend Sinister is where the hell I started, when it was thrust upon one. It’s not one of the album titles I recognised (not that I recognise many) and Rob suggested it was sonically and aesthetically atypical; this may be so, but it’s the politics of small differences, I suspect – it sounded like The Fall, as I understand them to sound, to me. It didn’t sound like Beyonce or Dave Brubeck or The Orb, is what I mean. I enjoyed Bend Sinister, and I borrowed a copy on CD; Hex Enduction Hour (which is one of the album titles I do recognise) too. But I’ve not got round to listening to either of them yet (partly because I’ve been busy); it feels like, even diced up into chunks and spoon-fed to me, I still don’t know where to start with The Fall.